St Mungo Museum provides an ideal platform for schools and other groups to find out about world religions. The museum education room offers handling boxes and activity sheets. At St Mungo Museum you can explore the world's six main religions: Buddhism, Christianity, Hinduism, Islam, Judaism and Sikhism and unwind in Britain's first Zen garden, symbolising the harmony between people and nature. 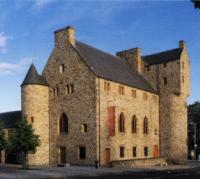 St Mungo Museum is close to Glasgow Cathedral and Provand's Lordship in Glasgow's City Centre. It is a short walk from Glasgow's central Station and Queen Street Station, and a minute's walk from High Street train station.